Narcolepsy is a rare disease that causes excessive daytime sleepiness. Other sleep disorders also cause sleepiness, including sleep apnea. Therefore, it is important to get the proper diagnosis prior to exploring treatment. How is narcolepsy diagnosed with tests? Learn how the diagnosis relies on some standard sleep tests including polysomnogram and the multiple sleep latency test (MSLT) and how to get testing. Among sleep disorders, narcolepsy is the second most common cause of excessive daytime sleepiness after sleep apnea. It affects about 1 in 2,000 people. It is a syndrome that consists of several characteristic features. Aside from the excessive sleepiness, there is also the sudden loss of muscle tone with emotions (called cataplexy), vivid hallucinations around the time of sleep onset (hypnagogic hallucinations), and sleep paralysis. Cataplexy characterizes type 1 narcolepsy. Despite these characteristic findings, only one in three people will have all four symptoms. If you suspect you may have narcolepsy, you should be evaluated by your doctor and a board-certified sleep specialist. There are other causes of excessive sleepiness, including simply not getting enough sleep, and these should be considered. After a careful evaluation and examination, other sleep studies may be recommended. The standard for the diagnosis of narcolepsy involves an overnight sleep study called a polysomnogram followed by a multiple sleep latency test (MSLT) the next day. Stimulants should be stopped the week before this testing, and antidepressant medications should be stopped 2 to 3 weeks prior. These medications, and withdrawal from them, may otherwise interfere with the results of the test. You may be required to have a urine drug screening to ensure the test results are valid. The polysomnogram will evaluate the nature of your sleep. Importantly, it will identify other potential causes of your excessive sleepiness, including other sleep disorders such as sleep apnea, periodic limb movements of sleep (PLMS), and REM behavior disorder. Sleep apnea is far more common than narcolepsy, and the treatment is very different. In many narcoleptics, the polysomnogram demonstrates spontaneous awakenings, mildly reduced sleep efficiency, and REM sleep that occurs within 20 minutes of the onset of sleep. 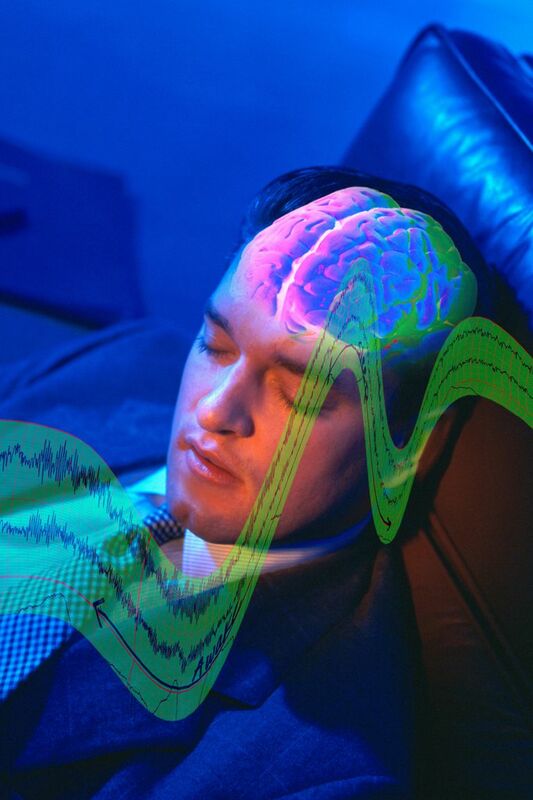 Normal people do not enter REM sleep until 80 to 100 minutes after going to sleep. Narcoleptics frequently are noted to have REM sleep in the first 60 minutes of their sleep study. After the polysomnogram is complete, the next day a multiple sleep latency test (MSLT) is performed. In the MSLT, or nap study, you are given four or five opportunities to nap every 2 hours. A healthy person will generally fall asleep in 10 to 15 minutes, but a person with narcolepsy may fall asleep in less than 8 minutes and will often have REM sleep in at least two of the naps. If they have sleep-onset REM (SOREM) in two or more of their naps, or with the diagnostic polysomnogram, this is highly suggestive of a diagnosis of narcolepsy. One of the occurrences of early REM may also occur as part of the overnight study. What Other Testing May Help to Diagnose Narcolepsy? There are a few laboratory tests that might also be used to diagnose narcolepsy. There is a genetic test called DQB1*06:02 (though it is not perfect and may also be positive in people who don't have narcolepsy). If the genetic test is negative, it is less likely the person has narcolepsy. In addition, if the sleep studies are negative, sometimes it may be useful to test the cerebrospinal fluid with a lumbar puncture procedure for orexin (or hypocretin levels), which may indicate the presence of narcolepsy. If these levels are low, or even zero, this cinches the diagnosis of narcolepsy. Unfortunately, this testing is not widely available and may require sending samples to specialized centers, including Stanford University. It can be difficult to diagnose narcolepsy. This often leads to a prolonged period between the initial symptoms and the final answer to the cause of the problems. Don't lose hope. If you are struggling to get an answer, consider an evaluation by a board-certified sleep physician. In some cases, a second opinion, and even repeated testing, may prove necessary to finally get the answer. This may ultimately lead to the possibility of exploring treatment with medications that may provide some relief. American Academy of Sleep Medicine. "International classification of sleep disorders." 2nd ed. 2005. Carskadon, MA et al. "Guidelines for the multiple sleep latency test (MSLT): a standard measure of sleepiness." Sleep 1986; 9:519. Thorpy, MJ. “Narcolepsy.” Continuum. Neurol 2007;13(3):101-114.